Designed to reflect the coastal cliffs of La Jolla, California and nearby Pacific Ocean, this architectural ceiling provides a beautiful light source to the common area of a prestigious university. 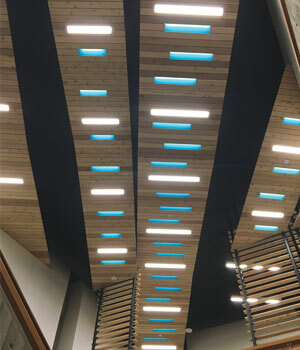 Airelight™ Linears illuminate each blue glass panel and pay tribute to the natural environment by using 50x less materials than conventional LED lighting fixtures. Airelight™ Luminaires are also 100% recyclable making them the superior option for sustainable building design. All Airelight™ Luminaires are UL Certified and contain no plastic or other flammable materials. The exposed light emitting ceramic surface is capable of withstanding temperatures as high as 3500° F which translates to unmatched fire safety. By comparison, conventional LED light sources use plastic diffusers or plastic waveguides which contribute toxic fumes in the event of a fire. Airelight™ Luminaires are, by design, free of toxins. To better showcase an artisan bakery's bread, Airelight™ Linears were surface mounted on existing wood shelves. 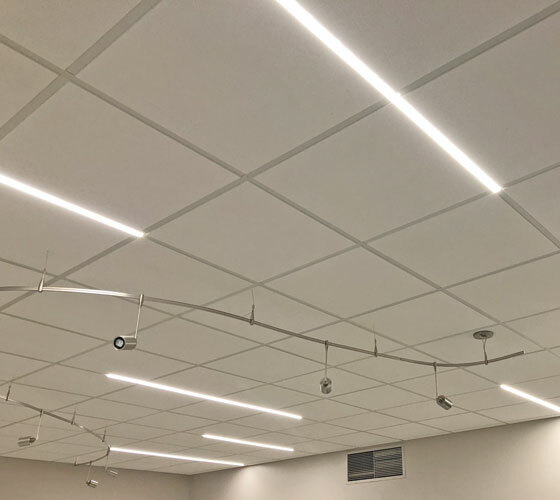 After securing the Airelight™ Linear ES 0.5 U-Channel with screws along the top edge of the shelves, the Linears were daisy chained together and oriented so that the light was directed toward the back wall. Full illumination of the bakery shelves was easily obtained using only 14 feet of Airelight™ Linears. The before photo of the shelves without Airelight™ Linears shows the significant impact this product has for display type lighting applications. Unlike conventional LED lighting, the uniform Lambertian (cosine) output distribution of Airelight™ Linears eliminate hot spots and glare in light reflected from the objects being illuminated. This attribute makes Airelight™ Linears the preferred solution for cabinet, undercounter and display case lighting. Left: With lighting installed on one shelf, the above shelf is only a few screws away from being equally well lit. Right: A "bread's eye view". Maintaining the slim profile of the Airelight™ Linear, the U-Channel serves as housing and provides an optimal solution for surface mounted lighting applications and under cabinet installations. U-Channel is available for both the Airelight™ Linear 0.5 and 1.0 widths and in multiple finish options (Steel Grey, White, additional color choices upon request). Constructed with 24 gauge steel, the U-Channel is light weight and can be installed with screws or mounting tape.